Hariharan, an eight year old boy who is studying III standard in Sri Prasanna Vengatesha Perummal Matriculation Hr. Sec School, Madurai. He is a kind of person who is lacking in a physical and mental competency. He cannot able to contest with other students. 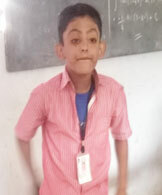 But he is very active student in the class. He is interested in learning English. He enjoyably study the communicative English programme providing by our kalvi trust. Initially he only knew to tell his name and his brother’s name and he cannot able to speak clearly if he speaks we doesn’t understand what he says. Inspite of this we taught communicative English to them. He started enjoying studying English after he had an interaction with us he started to read and write the words, names and now he can able to make a sentence. He is now capable to answer the question what we ask. The impact of the communicative English programme is now he is volunteering by himself and ask for some tasks to read and and he wanted to be as other students. With all these disabled skill he can try to make himself a confident and brave boy in the class. He learned many new things. This is the success of hariharan. Let our guidance and support will be with him for his improvement and betterment of his life. 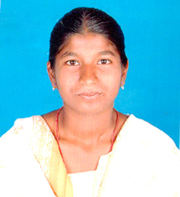 Ms.Vinodhini is an 18 year old girl who belongs to the poor family .she is from a backward community. There are 4 members in her family and they live in a small village near Madurai. She has completed her higher secondary in a government school. Her father is a former and mother is a home maker. So the earning of her father is a meagre to her family .and she has one sibling who is studying X standard.so their income is not sufficient to run the family. She came to our kalvi trust. Though technology is playing a major role we conducted basic computer education programme. She started studying the basics of computer in our trust. She is a hard working girl. She feels more responsible towards her family. After completing the course she is rendering her service in all computer education centers and she teaches basics of computer to kids also. She is now nearly earning 15,000 rupees per month which is very useful to her family. So that she wants to continue working so that she can take care of her family. Entrepreneurship programme for was conducted by kalvi trust in all our locations. The motive of this programme was to help the women and want them to make earnings on their own. Gita Mehta is the leader of a EDP center In addition Gita heads up training center teaching knitting and stitching as well as running a village shop selling products Confident, and self-sufficient. Gita is a role model for many young women in the community, and yet it wasn’t always so. Gita’s husband passed away three years into her marriage in 1996 leaving her a widow with a small son. To help make ends meet Gita started joining in this programmes at first her family weren’t supportive, and felt it would distract from her housework. But soon they realized how her income could help buy food for the family. Today Gita has made enough money to buy her own house, expand her business and send her son to an English medium school. But for Gita helping other women in distress is her primary motivation and she offers free training to those that cannot afford it.